HF: Waterfront Air (海翔航空) was an airline which was set up in 2008, (or possibly 2007,) with the aim of reintroducing seaplane services from Hong Kong’s harbour, initially with HK to Macau flights. Seaplanes operated in Hong Kong from the 1920s to the mid-1960s. 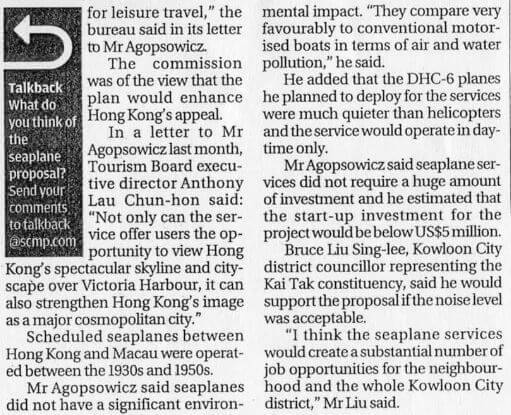 And I believe scheduled seaplane services operated between Hong Kong and Macau between the 1930s and 1950s. With many thanks to IDJ for suggesting this topic and providing material. 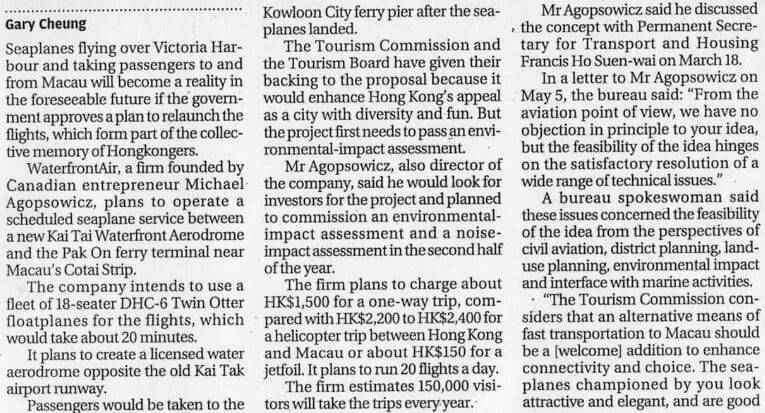 This 2008 SCMP article (1) introduces Waterfront Air and its founder Michael Agopsonwicz. 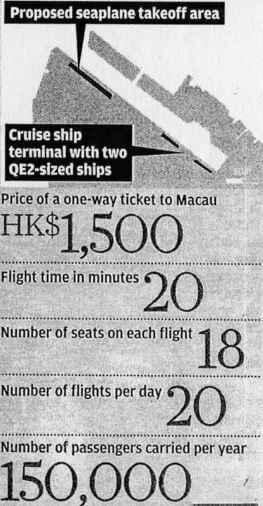 The HK-Macau scheme literally never took off or at least approval has not yet been granted There was a later plan by the company to launch seaplane flights from Shenzhen to Macau and Guangzhou, see the SCMP article of 7th January 2010 linked below. Perhaps someone can enlighten us as to what has happened to Waterfront’s attempts to get seaplane flights operating in HK and South China. The company website does not appear to offer details of its attempts to get any flights operating at present. This article was first posted on 13th May 2017.